Keeping Up ... with the Joneses: Jesus. The Way. The Truth. The Life. What is the mission of the Christian Church? In Luke 4: 18-19, Jesus declares his mission from God, using this direct quotation from Isaiah 58: 6 as follows: “The Spirit of the Lord is on me, because he has anointed me to proclaim good news to the poor. He has sent me to proclaim freedom for the prisoners and recovery of sight for the blind, to set the oppressed free, to proclaim the year of the Lord’s favour." 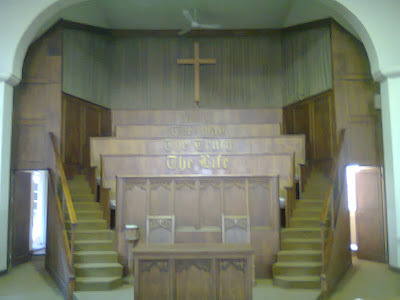 The Boshoff Street Methodist Church in downtown Pietermaritzburg has been partaking in this mission since 1882, and the picture shown is of the inside of the church building, with its choir pews upon which wooden carvings of the words "Jesus. The Way. The Truth. The Life" have been mounted. Sadly, the choir is no more. In fact, the congregation this morning comprised six attendees. For reasons that I'm not at liberty to go into here, this once-thriving congregation has declined to its current sad state. Yes, granted, the demographics have of the inner city have changed, and many people now worship at one the many suburban churches that have sprung up over the years, both Methodist churches and those of other denominations. But these factors are not the full story. Suffice to say that there have been issues brewing for a number of years, culminating in a recent upheaval that included the resignation of the former minister and the mass-exodus of a substantial portion of the membership. With the Circuit looking to consolidate the ministry work in the inner city, and now this latest crisis, one could be forgiven for sensing that the vultures are circling. And the question on the lips of those faithful few, who remain committed to a Society that may not be dead yet but is showing serious signs of coughing up blood, is this: Where to from here? Is this it? Is God finished with ministry at Boshoff Street? Perhaps the beginnings of a possible answer to this question lies in the sermon that Rev Diane Worringham conducted this morning. Preaching from John 11: 1-6; 17-37, which is the well-known account of the death of Lazarus, she asked, among other things, the question most of us would have asked if we were Mary or Martha: "Jesus, we sent for you - why on earth did it take you four days to get here?" One can sense the anguish in Martha's voice when she said to Jesus, "Lord, if you had been here, my brother would not have died". I must confess, with apologies to Diane, that my attention began to wander at this point, for I was beginning to say the same of Boshoff Street Methodist Church: "Lord, if you had been here, this church would not have died". And in the same way that Jesus wept when he saw that Lazarus had indeed died, I believe that he is also weeping for Boshoff Street. But when one goes back a few verses, we read that Jesus said to Martha, "I am the resurrection and the life. The one who believes in me will live, even though they die, and whoever lives and believes in me will never die". And it was at this point that my eyes became fixed on the empty choir pews, and the words inscripted thereon. "Jesus. The Way. The Truth. The Life". I must confess that I had questioned why the Seminary had chosen to attach me (together with two of my colleagues) to Boshoff Street for the remainder of my stay at SMMS. After all, I've been happy at Prestbury, getting involved with ministry to the senior citizens (which included monthly services at the Sunnyside retirement village). What is our brief, anyway? Are we here to bring about healing? Or are we here simply to give this nearly 130-year-old Methodist witness a decent and dignified burial? Yet as I sat there, looking firstly at the choir pews, then secondly into the eyes of the six congregants as we shared the benediction, I had a deep sense that somehow God is not yet finished with Boshoff Street. Time will tell. At this stage, our task is to be faithful, diligent, and caring - and to proclaim the Kingdom of God. And to help the Boshoff Street congregation rediscover that Jesus is indeed The Way, The Truth, and The Life. Engaging post. I suspect that it's chapter 1 in what will be an interesting story. Looking forward to the rest. How sad I was when I read this. I was doing a search of old haunts in Pietermaritzburg as I will soon be returning for a visit after 25 years out of the country. Our family attended Boshoff Street Church for many years, my sister and I were in the choir as teenagers, my sister was married there and we dedicated a pew to our father (Frank Martin Thornton) who died in 1981. Will hope to visit when we're over there. I do hope and pray that a miracle is worked in your congregation and that what seems 'dry bones' at the moment will receive new spiritual breath. God bless.